Circus Kathmandu arrive in the UK this week for the first time, finally performing at Glastonbury Festival after three failed visa applications that left them disappointed last year. This is one determined troupe, however, having come up through lives of child slavery after being sold from their Nepali homes into archaic Indian circuses, but now building professional careers for themselves as international performers in their own right. The Circus Kathmandu project was set up in 2010, after Sky Neal and Robyn Simpson, of circus production company Floorless, heard returning young adults who had been rescued from their former masters talk about their desire to continue performing circus on their own terms. With no formal schooling, but intense training behind them, these young people needed support to develop into professionals who could compete in an international market. Over 50 volunteers from around the world have worked with the troupe, and their first full length production Swagatam (meaning ‘welcome‘) was produced by Ali Williams of NoFit State Circus, who spent a year with them in Nepal, and was instrumental in arranging opportunities to perform in the UK. 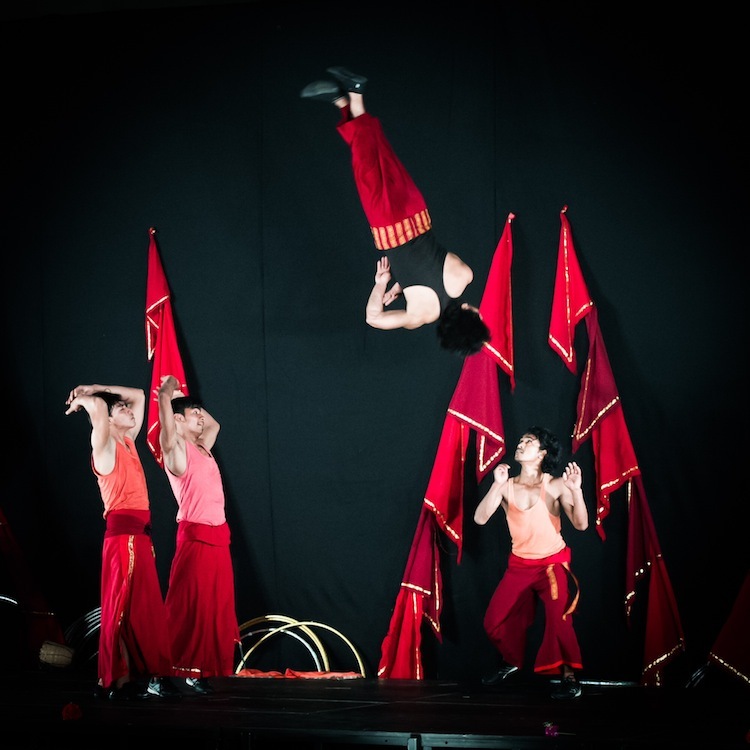 Funding from the Norwegian Arts Council has also allowed them to work on a creative exchange with Circus Xanti in Norway, providing chances to be seen at Porsgrunn International Theatre Festival and the touring Circus Village, as well as making the flights over to the UK affordable. We have tried a number of times to get them into the UK and they had almost given up hope of ever being able to come here. They are really happy about performing outside Nepal and are really looking forward to reuniting with some of the volunteers who have spent time teaching them or supporting the project in other ways over the last three years. They are also excited that they will see a lot of other circus performances at Glastonbury and that will really change their lives. Visa refusals have been our biggest issue and last year we were all heartbroken! We were all on tenterhooks waiting to hear from the UKBA this year and were so thrilled when we got the good news that they were given visas. The show is called Swagatam. It came from the idea of providing a platform for the group, as Nepali contemporary circus performers, to tell stories about their lives in Nepal. Whilst Ali was resident in Kathmandu she worked with the troupe to get them writing about their lives and, alongside designer Sean Donohoe, created the concept for this show. It has had various incarnations and has been worked on by numerous volunteer directors during 2013 . There is a theatre version, a street version and a full aerial version. For Glastonbury we will be performing an edited version of the full performance. We’re also going to attend an evening at the House of Lords to help raise awareness and hopefully to also help with long-term programme funding. Last year, Paul Evans, Duncan Milligan and Williams, who were in Kathmandu working on the show for Glastonbury, set up a joint fundraising page and raised over £3000. When we didn’t get the visas we spent the funding on essential new equipment (crash mats, floor mats and a trampette) for the troupe – with the permission of all the donors. The majority of our kit had been donated by the circus world so needed to be replaced to meet safety standards; we’re constantly fundraising to cover core costs, costumes and new equipment. We’re always developing new ways of funding these costs for the troupe. Our latest funding venture is a joint initiative called Artists Against Trafficking (AAT) where some very talented artists (including photographers, jewelers, musicians and sculptors) either choose or commission a piece of work and donate a percentage of its profits towards the troupe’s essential costs. Coming over to the UK are 11 performers (7 young women and 4 young men) and a Nepalese volunteer who will be translating and acting as company manger. He has been volunteering in Kathmandu with us for nearly two years. Some of the group already had good skills – two of the men are Nepali gold medal gymnasts. But it was how they learned during the first three-week creation period with us – and then performed – in January 2011 that revealed their potential. They were vibrant and excited and glowing with happiness during the first evening show – and the audience was in tears, standing up, applauding. It took time to nurture them from the point they were at when we started working together in 2010, to reach the point where they are ‘professional’. Now they are independent, employed performers who take charge of their own lives and help others. This group of young people is now ready to become professional circus artists internationally, where the competition is much tougher than it is in Nepal where no one has seen any contemporary circus. Also, technical and aesthetic standards are very different in Indian circus and that type of circus isn’t respected in Nepal. So we’ve had to re-define what we do as contemporary circus and raise the performing and technical standards, production values and professionalism. This has been a massive learning curve for the group – especially as it had to be done sensitively to the needs of thirteen individuals. They are treated as professionals and have been incredibly lucky to work with about 50 international volunteers over three years to develop all sorts of skills, including how to be confident and comfortable performers and teachers. Circus Kathmandu is underpinned by social circus yet it’s also about creating jobs and a sustainable industry so the acts and shows have to be professional for that to be achievable. We therefore have to keep raising their skill levels and educating the market about high-quality ethical entertainment. We’ve provided the opportunities, but it’s the thirteen of them that, against the odds, have turned their lives around and now do what they choose to as a job. In addition to their performance work, the Circus Kathmandu troupe run social circus workshops of their own for other young people in the city, and provide outreach support to vulnerable families living near the Nepal-India divide, warning of the dangers in areas where human-trafficking still holds grave risks. Tagged as ali williams, Circus, circus kathmandu, Contemporary circus, culture, duncan milligan, glastonbury, human traffic, india, nepal, paul evans, Performing Arts, robyn simpson, sean donohoe, sky neal, slavery, social circus, swagatam, trafficking.